As popular as DIY smart home devices are becoming, it’s still an intimidating process for many homeowners who don’t consider themselves tech-savvy. That’s why we’ve put together this quick FAQ that addresses all of the common concerns and uncertainties that deter people from taking the leap toward smarter homes. Check out the answers below, and if you still have questions, feel free to give us a call or shoot us a message on Facebook or Twitter! While some smart products don’t require a hub at all, if you really are going for the full package “smart home,” then a hub is the way to go. Treat the hub as the central controller for all of your different smart home automation devices. Instead of downloading separate apps for each device, you can use your hub to centralize everything. The other benefit of a hub is that it lets you do things like create scenes in which multiple smart devices work together to create the perfect environment for each room or activity. In short, yes: you need a hub. It’s really a matter of personal preference. Take a look at the features and price points of the top hubs and then decide for yourself. If you want some guidance on where to look first, a few of our favorite hubs are made by SmartThings, Wink, Vera, and Logitech Harmony. DIY smart home automation is not for everyone. Smart devices are definitely becoming more user-friendly, but if you’re not comfortable with basic wiring or configuring technology, then you might be better off getting a professionally installed system instead. But don’t let that scare you away from DIY systems entirely! DIY smart devices are designed to be easy to install, and you can always find helpful how-to guides and videos online. Unless you are particularly technologically challenged, you’ll be able to create a smart home by yourself in an afternoon! Z-Wave, Zigbee, WiFi, Insteon…What are these technologies and which should I choose? Each of these technologies is a different way to communicate with smart devices. There are a lot of differences between them (which we coverhere), but our recommendation goes to Z-Wave or Wi-Fi. Z-Wave technology is supported by all of the hubs mentioned earlier, and there are thousands of devices to choose from. For DIY smart homes, Z-Wave is the standard for ease of use, security, and reliability. What are the most common starting devices for a smart home? DIY home security devices such as motion sensors, door locks, and door/window sensors. Media control for your TV, sound system, etc. How many devices should I start with? Once you have a hub, you’ll want to put it to use! We recommend starting with three or four devices, figuring out what you like about them, and then growing your system over time. Smart hubs can control hundreds of devices, so you don’t have to worry about reaching a limit. How much will a DIY smart home automation system cost? The answer to this question will depend a lot on the aspects of your home that you choose to automate. Some smart hub providers offer ongoing monitoring services that will cost a little bit extra each month, while others will require only an upfront cost. To get a high-quality hub and several smart devices, you’re looking at anywhere from $150 to $300. 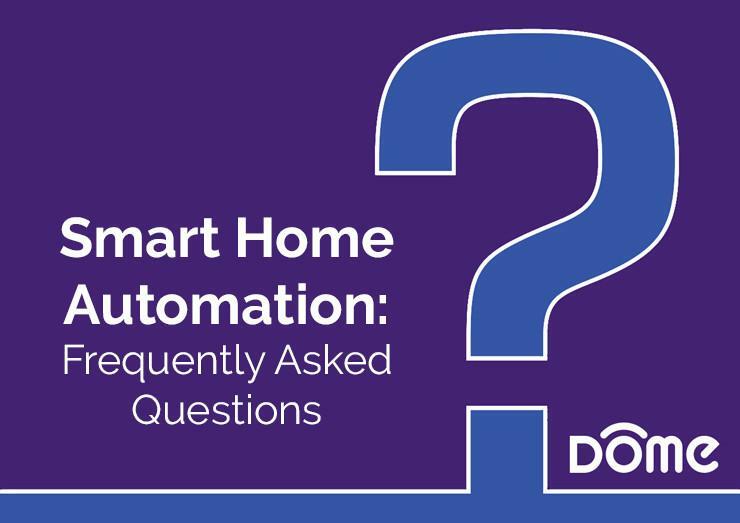 We hope this guide helped to answer some of the questions you have about DIY smart home automation. To learn more about Dome’s smart devices and how you can add them to your home, contact us today at (855) 249-1754!